A poisonous green cloud approaches. To your left, your scared wife and young son, trembling in one another's arms. 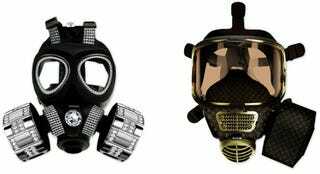 To your right, three Diddo Velema gas masks complete with Gucci and Luis Vuitton detailing. You realize that the masks are probably just a pointed artistic commentary of the violent, consumer world you live in. But it's still not worth putting a haughty, overpriced purse on your head.